Apple has released iOS 12.1 beta 4 for iPhone and iPad to developer beta testers. Separately, Apple has also released the fourth beta versions of watchOS 5.1 and tvOS 12.1 for users testing beta software on Apple Watch and Apple TV. iOS 12.1 beta includes many new Emoji icons including a kangaroo, frisbee, lobster, and bagel. iOS 12.1 also includes support for group FaceTime video chat with up to 32 participants in the same video call. Presumably iOS 12.1 beta also aims to address bugs and other issues identified with prior iOS 12 releases. 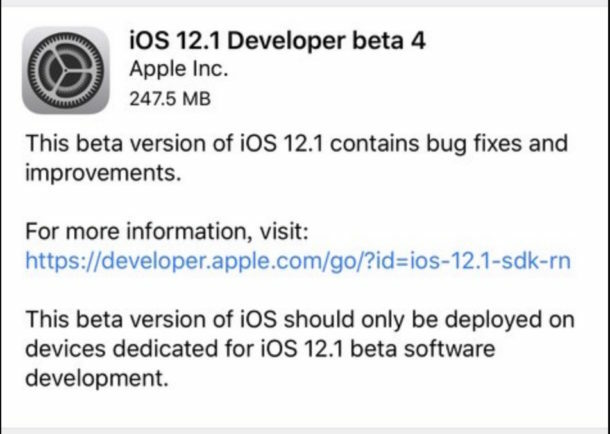 iPhone and iPad users with iOS 12 beta versions on their devices can find the latest iOS 12.1 developer beta 4 build available now from the Software Update section of the Settings app. If you had previously run iOS 12 beta versions but later decided to stop receiving future iOS 12 beta updates, you would need to re-enroll a device by installing the beta profile again to see the iOS 12.1 beta 4 update available. Likewise, new watchOS beta and tvOS betas are available to download for enrolled devices from their respective Settings apps as well. Typically an iOS (and macOS) developer beta build is available before a public beta build, thus public beta users will likely find the equivalent new beta releases available shortly. Apple usually goes through several beta builds before issuing a final version to the general public, suggesting that the final release of iOS 12.1 may arrive sometime next month, perhaps alongside new iPad hardware, or perhaps even sooner with the release of iPhone XR. This is all speculation of course, as there is no known public timeline for when iOS 12.1 will be finalized. While macOS Mojave 10.14.1 is currently also in active beta development, it has not been updated yet and remains as macOS 10.14.1 beta 3.